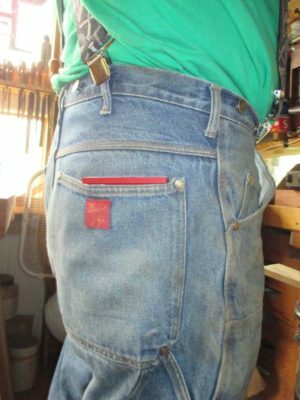 I’ve blogged before about the DelVe Square from Woodpecker’s, a tool I count among my very favorites and when I am in the middle of fabricating stuff it pretty much lives in my hip pocket. The tool was a “One Time Only” tool but apparently it has such a following that demand has led them to manufacture another run of them. I got an email from Woodcraft for the tool, although it may be available elsewhere as well. I recommend this to you without hesitation. I’m going to get couple more myself. Do I really need the disclaimer that I do not derive any benefit from the stakeholders? With the necessary new parts fabricated and the performance determined, it was time to prettify the tool. This was a pleasantly brief undertaking. Since the wooden infills were already beat to death I sanded them down to bare wood, then ebonozed them with India ink slathered on and allowed to soak well in. Even then the color is not like something painted black, it has the varieties of surface that are especially pleasing to me. Following the ebonizing I brushed on a coat of Tru Oil cut 50/50 with naphtha and allowed that to sit for an hour or so, then would have wiped off any excess had there been any (there was not). Once the surface was completely dry to the touch I applied a coat of full strength Tru Oil, and once that was dry I sanded out any nits and applied the final coat of Tru Oil. A week or so later I buffed that with Liberon 0000 steel wool as I did not want a mirror finish on the wood in this case. Once that new finish was cured I reversed the masking and gently scrubbed the steel body with FFFF pumice to remove the accreted gunk and brighten it up a bit, but not enough to make it look new. 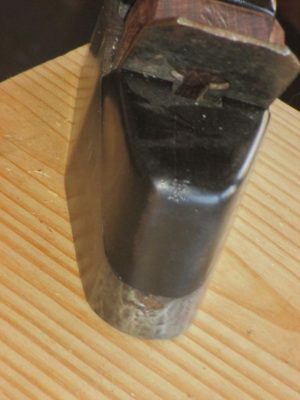 One thing that remains undone at the moment is the heel of the plane, with both the metal and wood sections having been damaged by hammer abuse in the past. Once my Round To-it arrives I will fashion a new brass plate to extend from the sole to the top of the heel to provide a better surface for adjusting the iron. Giving the plane a test drive on a flat board is a joy. 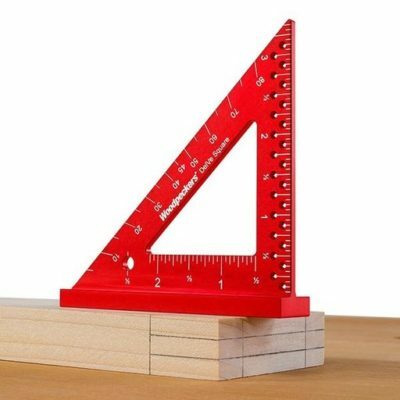 Having never owned one before I was struck by how useful the mass of the plane is. 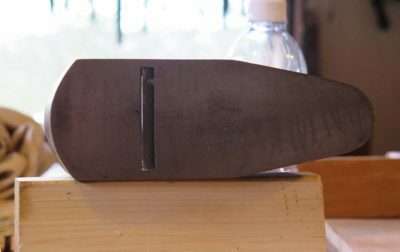 Though on the smallish side, it weighs a lot given the steel body and hardwood infills, thus reducing the vibration and chatter as it cuts though the wood fibers as an almost self-dampening feature. With everything tuned up, and the iron nearly to the point I want it, it effortlessly spews gossamer shavings and leaves behind a surface that is unbelievably smooth. Huh, maybe that’s why they call it a smoother. 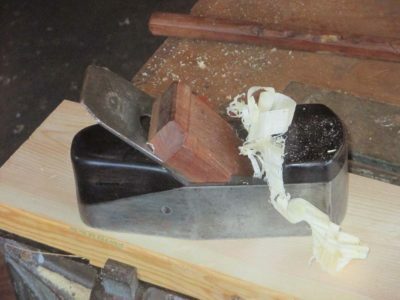 Given the starting point and cost, I was not displeased with my first honest to goodness smoothing plane. 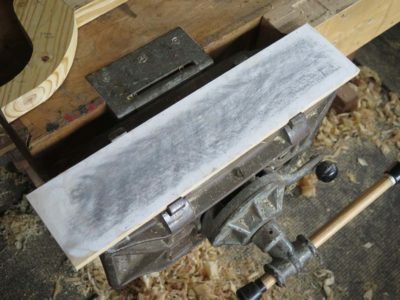 then sharpening the blade with my diamond stone-ceramic stone sharpening regimen followed by honing on my micropolish impregnated plywood strop. 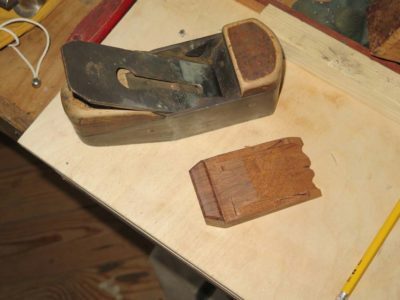 In this case I also had to fashion a new wedge, which I did from a piece of mahogany from the scrap bin. 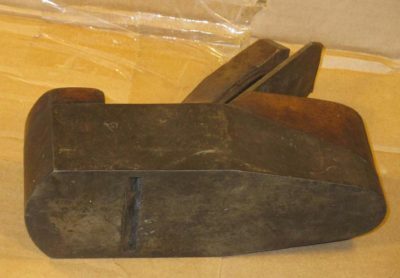 Once I got it to fit the body and iron perfectly I started to play with my small Auriou model makers rasp, shaping it so it would be a bit interesting. I was not entirely pleased with the wedge after a while of working on it, but at least it worked well in holding the iron on the bed. I assembled everything and gave it a test run. Magnifique. The good/bad point of the past several weeks is that since my recuperation was underway but not complete, I could spend time in the shop but my arm/hand was not yet flexible and strong enough to undertake real work at the bench. I did have enough capacity to putter in the barn, so I did. 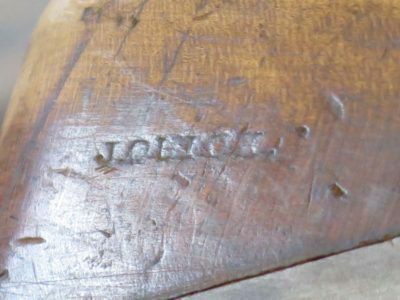 One that totally caught my eye was this infill smoother of unknown lineage, bearing a single stamp of “J.Quick” although I have no idea if this was the maker or the owner. The tool , in the words of my pal MikeM, “looked like a stretch of bad pavement.” There was no denying it was a “project,” but being in a box lot of tools I got for about $75, its $15 price tag made it worth a bit of risk, imagination, and time. Notwithstanding my friendships with infill plane makers of the highest repute like Konrad Sauer, Raney Nelson, and Ron Brese (although almost certainly due to the fair prices for their creations their planes are generally well beyond my means) my inventory of infill planes has been pretty scarce. One, to be exact. I addressed this lacuna at Donnelly’s, both in the auction and out in the yard of tailgating. This sad little smoother was sorta intact, but not really. 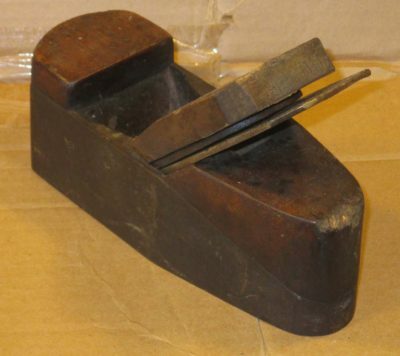 Neither the iron nor the wedge were original, or even fit the body. Getting a good iron was no more complicated than going to the drawer in the cabinet with the spare tool parts. I found a very nice old tapered laminated blade that was about 1/128″ too wide, a situation resolved in about a minute on the diamond stone. The wedge took a little longer, refurbishing the body even longer still, but in the end the results were pretty nice. Some years ago I became acquainted with artist David Warther, the astounding sculptor who fashions historic ship models in ivory and ebony. Adjunct to his artistry David dealt in documented heritage ivory (pre-ban “estate” ivory) to clients far and wide. Thanks to enviro-hopesters inhabiting the swamps of DC in recent years virtually all commerce in ivory has been deemed icky and thus illegal, ultimately redounding unfavorably to elephants (and I say this as a lover of elephants, but history is a powerful instructor about the results of declaring something to be contraband, but then enviro-hopesters prefer wishful thinking to empirical observation). Nevertheless David’s unparalleled artistry continues with materials he already held in his personal inventory, and he sent me a new video about his work and the museum featuring it. The new video is not yet on-line, but here is the previous one for your viewing pleasure. Which of these two animals is native to North America, bison or pigs? Which of those two animals is more abundant in North America now? After four months of greatly reduced activity during recuperation, the last two months in nearly constant travel (family friend’s wedding in Maryland, family and friends in Minnesota, family Thanksgiving in Nebraska, family Christmas in California, interviews for articles, my Mom’s 100th birthday in Florida, etc.) this week I am returning to the shop, nearly full time and nearly fully two-handed. Except for some very brief times out into the great big wide world I expect to be there about every day for many months ahead instead of the occasional forays of the recent past. I’ve got a boatload of interesting projects there and will strive to blog three or four times a week, unless I really get up a head of steam. It is good to be back home. It’s an ambitious program of events for the coming summer at The Barn. Here is the full slate of activities. 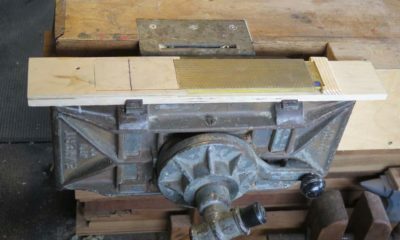 May 23-27 Making a Ripple Molding Cutter – this is less of a workshop than a week long gathering of fellow galoots trying to design and build a machine to allow us to recreate ripple and wave moldings. Material and supplies costs divvied up, no tuition. 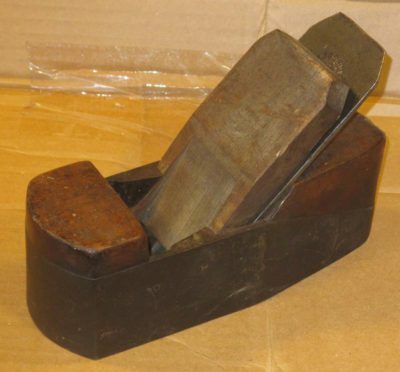 June 16-18 Make a Nested Set of Brass Roubo Squares – This is a weekend of metal working, as we fabricate a full set of nested brass squares with ogee tips, as illustrated in Plate 308 of l’art du Menuisier. The emphasis will be entirely on metal fabrication and finishing, including silver soldering with jeweler Lydia Fast, and creating a soldering station for the workbench. Tuition $375, materials cost $50. 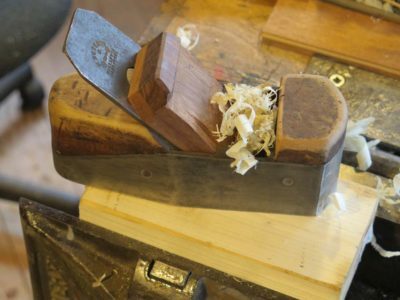 July 24-28 Minimalist Woodworking with Vic Tesolin – This week long session with author and woodworking minimalist Vic Tesolin will begin with the fabrication, entirely by hand, of a Japanese tool box. Who knows where we will end up? I am looking forward to having my own work transformed. Tuition $625, materials cost $50. 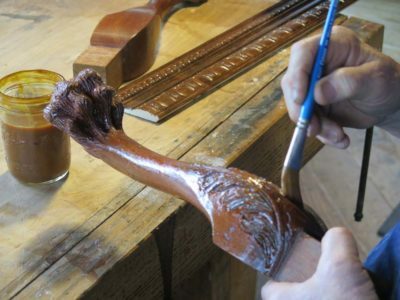 August 11-13 Historic Finishing – My own long-time favorite, we will spend three days reflecting on, and enacting, my “Six Rules For Perfect Finishing” in the historic tradition of spirit and wax coatings. 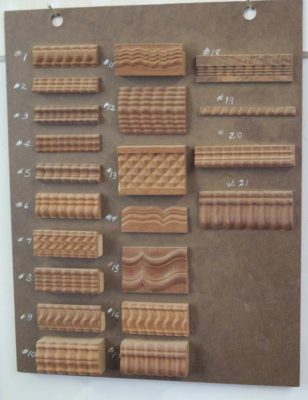 Each participant should bring a small finishing project with them, and will accompany that project with creating numerous sample boards to keep in your personal collections. Tuition $375. 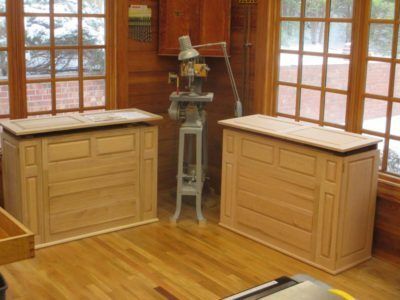 September 4-8 Build An Heirloom Workbench – I’m repeating the popular and successful week-long event from last year, wherein the participants will fashion a Roubo-style workbench from laminated southern yellow pine. Every participant will leave at the end with a completed bench, ready to be put to work as soon as you get home and find three friends to help you move it into the shop. Tuition and Materials $825 total. Since some recent research revealed the attention span of Americans to be eight seconds, I’ll re-run this periodically. If any of these interest you drop me a line here. 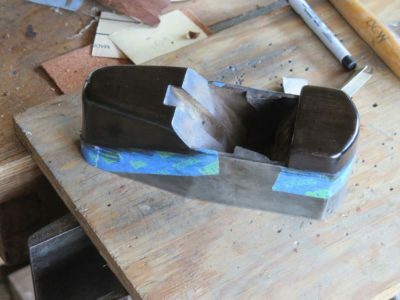 Last week I reprised my visit to the Studley 2.0 tool cabinet and workbench to interview the maker and to fill in the voids in my notes for fashioning my latest article for PopWood. 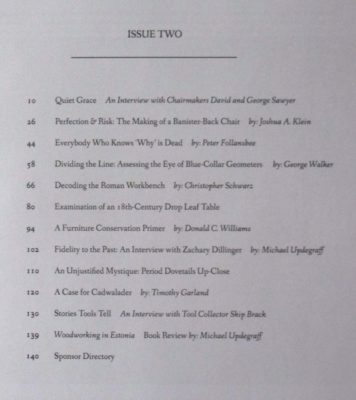 With that delightful interlude completed I wrapped up the article manuscript and submitted it ahead of schedule. I’ll now wait for word back from the editorial cabal there and forward the images once they give me the okay. One of the real treats during the visit was to see Jim’s latest project with Mrs. Jim, to make a his-and-hers pair of Hammacher-Schlemmer replica apartment workbenches. They are exquisite, as is the case with everything he makes. 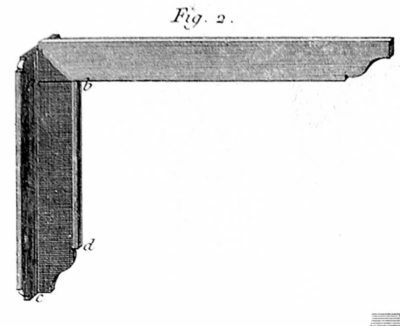 Now on to the next article, on templates and jigs for making French parquetry. 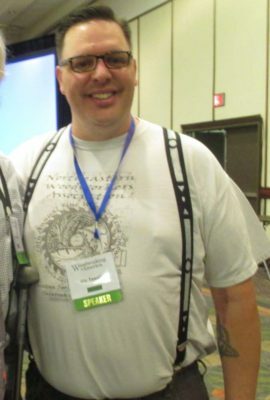 Poking around the interweb often has many surprises, and sometimes they are beneficial. 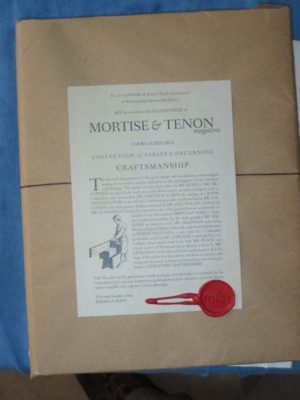 I was delighted to get a “You’ve got a package” notice in my PO box today, and my delight was amplified with the realization that the package was Volume 2 of Joshua Klein’s Mortise & Tenon magazine. I can’t wait to get plowing through it. 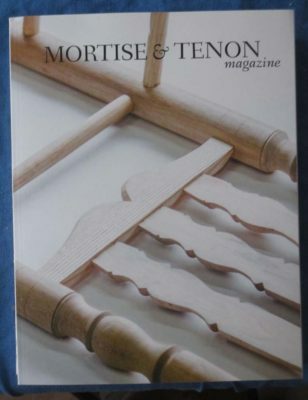 If you did not already order your copy of M&T make sure you get on board. 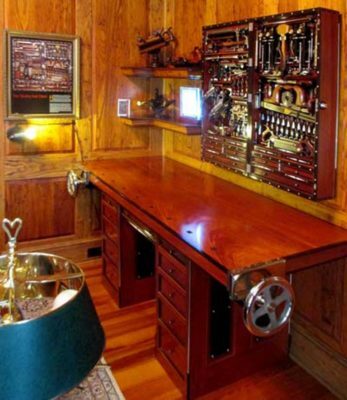 This really is the Golden Age of tools and toolmaking, furniture craftsmanship and scholarship, and the community of artisans.